I am excited to announce the launch of the third issue of Organs Everywhere (Œ), available for online browsing or download here. 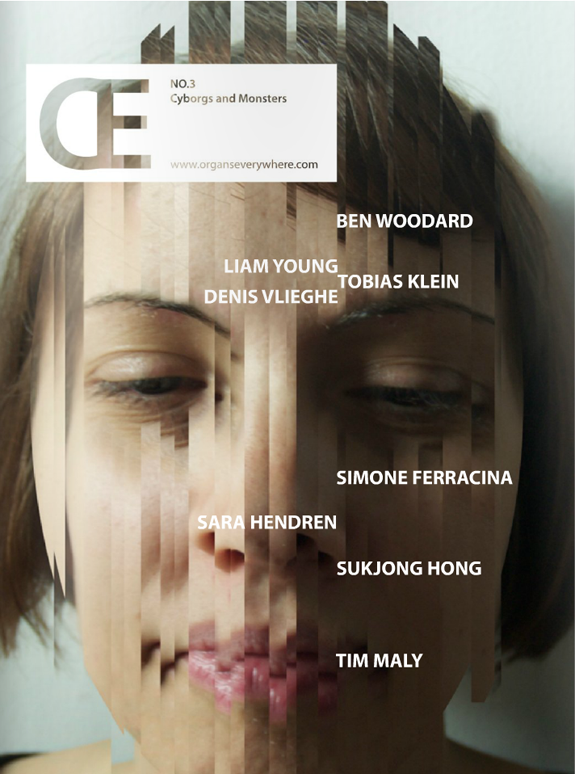 This issue, entitled “Cyborgs and Monsters” combines contributions by an outstanding pool of thinkers, writers and designers: Ben Woodard investigates the space between haunted and green houses, and calls for the opening up of ‘homeness’ to broader outside ecologies. Liam Young and Tobias Klein with Denis Vlieghe explore the effects of external flows on the internal geographies of the body. Simone Ferracina performs digital plastic surgeries on the body as perceived in virtual/physical blended space. Sara Hendren proposes an ethics of augmentation rooted in the cyborgian experience of disability. Sukjong Hong transforms and overwrites the monstrous ‘others’ generated by Cold War narratives. Tim Maly narrates the science fictional story of a woman who gets pressured into consuming the drug-filled remains of an enemy academic. Thanks to the contributors for their amazing and generous work. And to everyone else, enjoy!